What could be better than cats and knitting. Would like to see more mention of the cat though. Hats off to Sadie Hartwell once again for keeping me totally enthralled with this knitting mystery! These are awesome stories and I can't wait for the next one!! Beautiful patterns at the end also. 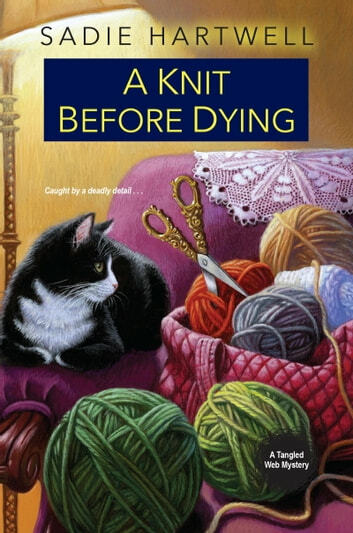 If you love knitting or crochetting and suspense/mystery this is the book for you. So what are you waiting for....get yourself a cup of tea/coffee grab your favorite project and pick up a copy of "A Knit before Dying" today!!!! Rarely do I give a book 5 stars. It wasn't difficult to decide to honor Sadie Hartwell, Josie and the fun residents of Dorsett Falls with my 5 star rating. Here's what I liked loved about A Knit Before Dying. If I was choosing the best plot of the year it would go to Sadie. Best integration of title to the plot. I don't want to give anything away but this author does an amazing job of weaving or in this case Knitting the title into the plot of the story. Best integration of theme of series to the plot I don't think I've read a book with a better integration of the theme. The knitting theme is woven through out the book/plot. The author provides patterns at the end. The cast of characters in A Knit Before Dying are fun and endearing. Josie gets some help from Miss Evelyn is an elderly bit of a snoop. Always ready to jump cook a casserole or jump in and help Josie out in her sleuthing. Or instigating a little matchmaking. Josie's uncle Eb is just a character who plays tricks on a neighbor all because of a years old family feud. Then there is Lorna the cook and waitress of the local diner. Lorna plays a huge part in the plot/story by providing food for Josie and Uncle Eb. I don't want to 'spill the beans' so to speak but the story ends with Lorna becoming the owner of the local diner. Will we see Lorna as a main character in a future installment? We can only hope! I would love to see some of Lorna's recipes included. There is a brewing romance between Josie and her neighbor Mitch. I suspect that things might begin to simmer in book 3. 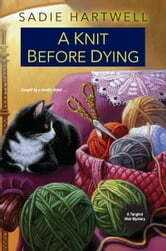 Although A Knit Before Dying is book 2 of the series it is written as a stand alone book. I have not had the chance to read book 1. I was not at all lost. The only negative I can mention is the wait for book 3! If your a fan of good and clean books you need to check this book out! I received a complimentary copy from Great Escape Tours.